Oversized chess and checkers boards, a concrete ping-pong table, and a figure-eight walking track are just a few features of Cleveland's newest playland for kids—and kids at heart. As of this Thursday, Oct. 19, a group of people spanning multiple generations will have a new place to play, learn, and socialize when Cleveland Neighborhood Progress (CNP) dedicates its Intergenerational Playscape and Garden on the front yard of St. Luke’s Pointe in the Buckeye-Shaker neighborhood. The playscape is one of the final steps in the transformation of the historic St. Luke’s hospital building campus, which has truly become an intergenerational learning center. In addition to being the home of CNP, the St. Luke’s Foundation, and the Intergenerational School, the building also holds affordable senior housing, the Boys & Girls Club of Cleveland, and Centers for Families and Children offices. “The whole model is treating the community itself as a lifelong continuum of learning, from ages three to 93,” says Wayne Mortensen, CNP’s director of design and development. The playscape and garden comprises 1.5 acres of greenspace on the campus. Designed for interactive play and learning, the space seamlessly incorporates nature with vegetable and wildflower gardens, a learning gardens overseen by the Saint Luke’s Intergenerational Gardening Society, a willow tunnel (made from willow branches bent into an arch), and a stump walk—where tree stumps form a course for users to hop from stump to stump. The area is also intentionally inclusive; for instance, Mortensen says the figure-eight walking track features smooth asphalt paths for people of all physical abilities. Ellie the ElephantTrue to form, the playscape has some whimsical visual touches. 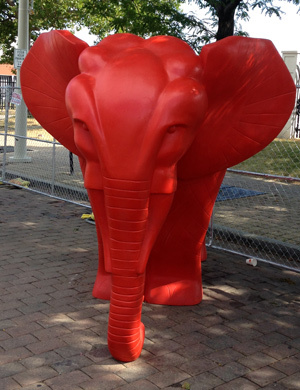 According to Mortensen, they have secured Ellie the Elephant from LAND studio’s 2016 CrackingArt series #flockCle as a public art centerpiece. The project was made possible by $200,000 in state funding and matched by local donations from the St. Luke’s Foundation, CNP, Alan Rosskamm with Friends of Breakthrough, and Jane and John Outcalt. Mortensen credits State Senator Sandra Williams with securing the state funding. Additionally, the soon-to-be renovated E. 116 Street/St. Luke’s RTA Rapid station is located just adjacent to the entrance of the playscape and will welcome all members of the community into the park. “This soon will be a fully-accessible public amenity,” says Mortensen. The ribbon cutting and dedication will take place from 3 p.m. to 4:30 p.m. on Thursday. The presentation will be followed by beverages and snacks. The event is open to the public, but registration is encouraged.